At SXSW, Joe Biden pledges to work with Trump to end "cancer as we know it"
In Austin on Sunday, former Vice President Joe Biden said he hopes the Trump administration will be committed as the Obama administration was to the goal of eradicating cancer. Former Vice President Joe Biden pledged Sunday to work with President Donald Trump in the fight against cancer, a cause Biden took up in his final year in office — and following the death of his son. 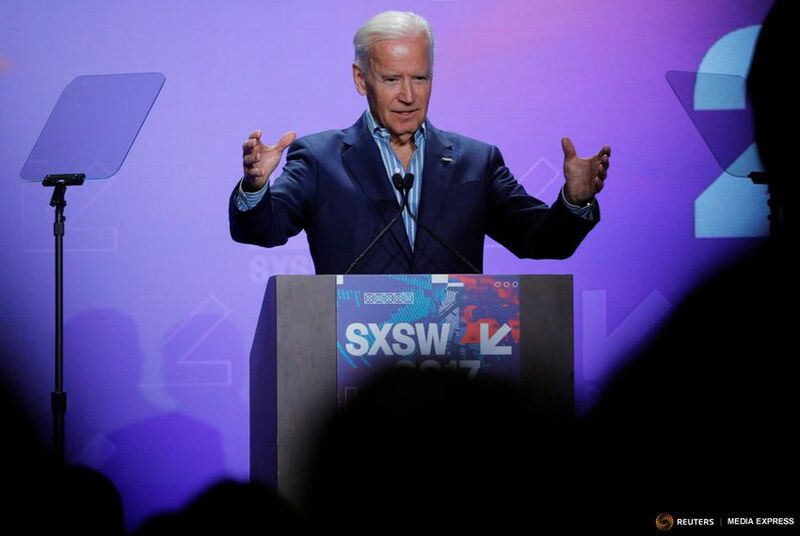 "It is my hope that this new administration, once it gets organized — and I’m not being facetious — will be able to focus on and be as committed and as enthusiastic as we were in the goal of ending cancer as we know it," Biden said during an emotional speech at the South by Southwest Conference in Austin. "I will do everything in my power to work with the new administration." In his 2016 State of the Union address, former President Barack Obama tapped Biden to lead an effort to eradicate cancer as the world knows it, a project that later became known as the Cancer Moonshot initiative. A year earlier, Biden had lost his son to brain cancer at the age of 46. Biden said Sunday he was still optimistic Congress could make strides toward rooting out cancer, even in the polarizing era of Trump. “The core of Republicans in the Congress and Democrats are good, decent, honorable people being almost artificially separated by a new kind of partisanship,” Biden said. "I’m confident we can break through it." Biden on Sunday did express some frustration with the Trump administration, however. While listing clean air and water as ways to prevent cancer, Biden said it was "notwithstanding the fact that some [people] in the new outfit" are skeptical of global warming. "I shouldn’t have said it that way," Biden said to laughter. "But it frustrates me. It frustrates me." Biden otherwise used his speech to implore SXSW attendees to join the battle against cancer, recalling at one point how he was recently asked why he was heading to the festival to talk about the disease. "Because there’s some of the most innovative minds in the world sitting in front of me," he replied. Biden's effort to fight cancer has previously taken him to Texas. Last year, he visited Houston to unveil new proposals on clinical trials during a speech at Rice University.